The Magic will try to slow down the visiting Hawks, who have won five of their past six games. The Atlanta Hawks salvaged a victory in their first game without Al Horford thanks to some timely individual performances. Whether they can sustain success without their top scorer for an extended period remains to be seen. 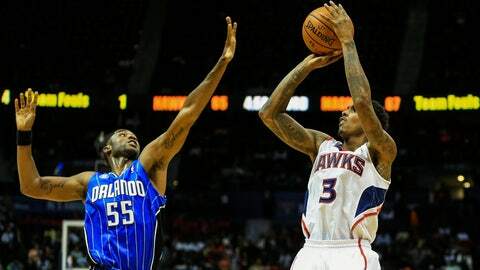 Atlanta looks for a sixth win in seven games Sunday night when it visits the Orlando Magic. The Hawks (17-13) were without Horford on Saturday versus Charlotte after he suffered a torn right pectoral muscle in Thursday’s double-overtime win at Cleveland. Horford, who leads Atlanta with 18.6 points and dropped one-tenth behind Paul Millsap’s team-leading rebounding average of 8.5, will likely require surgery and could miss the rest of the season. Atlanta was 2-6 without Horford last season but had enough for a 118-116 overtime victory over the Bobcats. Millsap and Lou Williams each recorded season highs with 33 and 28 points, respectively, with 10 of Williams’ points coming on free throws in the extra period. The Hawks trailed by 14 late in the third quarter before rallying and Pero Antic hit a 3-pointer off one leg with 3.1 seconds left in regulation to force overtime. "Everybody’s still a little shocked about the situation," said Millsap, who is averaging 26.0 points in his last three games – 8.6 better than his season average. "You could tell. Al’s a big part of what we do, but once we shook it off, guys just got out there and played ball." Still, Atlanta was noticeably weaker at the center position, with replacement starter Elton Brand, Antic and Gustavo Ayon combining to go 2 for 13 for six points. "It’s going to take some time to learn to play without Al," coach Mike Budenholzer said. "We have to get everybody comfortable, to keep the ball moving, to know where the spots are. I thought our start was OK, actually." Even with Horford, the Hawks have generally struggled on the second game of back-to-backs, going 2-4. They had won 11 straight over Orlando, including this season’s first meeting, before a 109-92 home loss on Nov. 26. The Magic shot 50.6 percent with Arron Afflalo scoring 26. Orlando hadn’t scored more than 94 points over the previous 13 meetings, averaging just 82.3. The Magic (9-20) played well offensively in a 109-92 home win over Detroit on Saturday, shooting 52.9 percent after shooting 41.7 percent during a five-game home skid. "It’s good to get a win at home for once," said Afflalo, who had 23 points on 9-of-11 shooting. "I don’t think we’ve won here this month … I thought we shared the ball throughout the game, made the right play. "When we play like that I think we’re pretty good." Afflalo gave the Magic a scare when he turned his ankle in the third, though he eventually returned to finish out the quarter before sitting out the final period with the game well in hand. He’s averaging 24.6 points on 55.7 percent shooting and has made 14 of 23 3-pointers over his last five games.